You are invited to our VIP Slimming Beauty Event featuring T-shape machine. Spaces Limited RSVP by February 21st 2019. We have exclusive packages for attendees! Fall in love with your body again! Tighten the skin and stimulate collagen production without surgery or downtime. T-Shape combines LASER, RADIO FREQUENCY, VACUUM. The T-Shape technology combines laser, radio frequency and vacuum to tighten the skin and stimulate collagen production. It works on body and face areas. T-Shape is effective in reducing cellulite, localised fat, improving circulation, improving skin elasticity and anti-ageing treatments. Depending on the treatment, the components of the modular system can be used either together or separately. Thanks to T-shape powerful toning and relaxing action, it guarantees visible results from the very first visit. T-Shape is a new generation treatments that remodels of the contours of the body and the re-consolidates the skin of the face. From small improvements in the problematic areas, to the major transformations over the entire body, we can help you look your best. 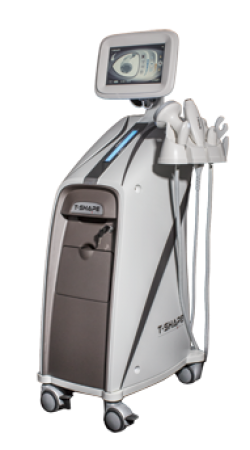 T-Shape combines three different technologies that include multi-polar radiofrequency, the LLLT Laser and Vacuum massage with various dynamic impulses. The combination of multi-polar radiofrequency and laser LLLT creates an intense thermal heat in the connective tissues, including fibrous septum. This promotes an increase in deposits of collagen and cell metabolism, resulting in a considerable reduction of the volume and localized skin laxity. The concomitant function of vacuum aspiration generates an immediate increase in blood circulation and lymphatic drainage, both essential for improving overall health. T-Shape generates an alternating multi-polar current of 1.5 MHz radio frequency. From the contact between RF energy (radio frequency) and the impedance tissue, it is to generate heat. The dermis, collagen-rich, heated to a temperature above 60 ° C, is immediately denatured and the fibrils contract and thicken. In response to the initial heat is produced in a subsequent formation of new collagen, with a skin that appears more firmed, lifted and younger.